Tis the season for rabbit! 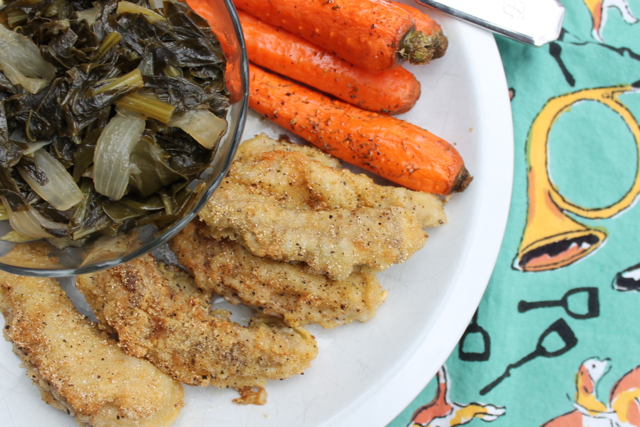 Here is a simple and delightful way to prepare this tasty white meat, with two Southern vegetables – a meal fit for a country boy. 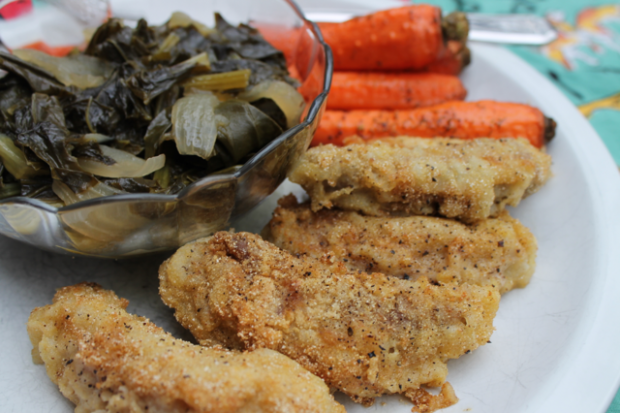 We’re serving, pan-fried rabbit tenders with roasted carrots and turnip greens! 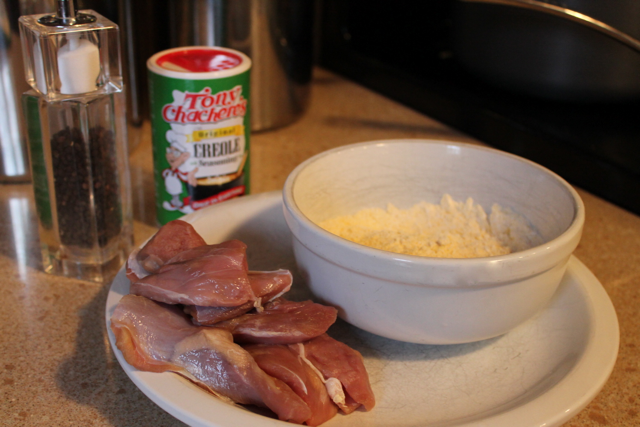 Trim and prepare tenders for frying. Heat a couple of tablespoons of vegetable oil in large skillet over medium to high heat. Dredge tenders in cornmeal / flour mixture on both sides until well coated. Drop into heated skillet. While cooking, season to taste with either Tony Chachere’s or salt and pepper. Cook on each side about 2 – 3 minutes until browned and cooked through. Do not overcook the rabbit. Like other game meat it dries out easily and becomes tough. Transfer to paper towels to absorb any excess oil before serving. Wash and peel carrots. Place carrots in a single layer in a jelly roll pan or casserole dish. Lightly drizzle with olive oil and sprinkle with kosher salt, black pepper and dill. Bake at 400 for 15 minutes. Do not over cook! These will be tender yet firm, overcooking will cause the carrots to lose their color and begin to dry out. 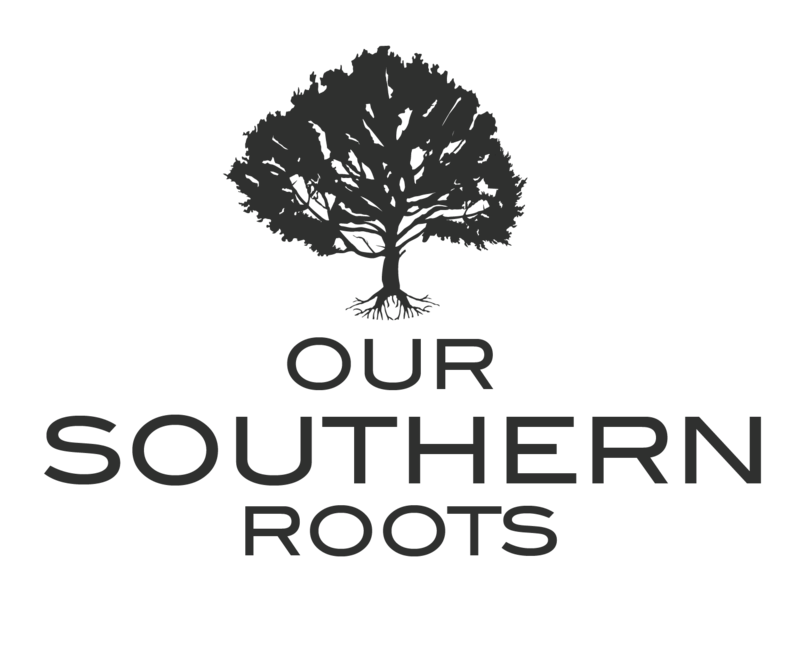 Wash a mess of turnip greens and cut through the bunch several times to make them easier for your fork. Set aside. Bring 6 cups of water to a boil and add a ham hock (or your meat of choice, if meat is uncooked, cook for 30 minutes before proceeding). Reduce heat to medium and add a chopped onion and the turnip greens into the pot. It will look like your pot is overflowing, but don’t worry, they will cook down significantly. Add sugar, vinegar, salt, pepper, and ginger to the greens. Cook with the lid tilted for 30 – 45 minutes, or until greens are to desired tenderness. Taste and adjust seasoning for your personal preference.